Comparing areas in your sample injection to standard injection? I have 4 actives in my sample and I run the standard (with the same 4 actives at the same concentration) followed by my sample, 1 injection each. The specification is that the area of my actives in my samples has to be less than that of my standard. I know you could just throw up a table in a report method of areas by standard/sample and look at it but is there a way for Empower to calculate this? GT(Area,S.%. (Area)) but that returned a blank value. Then I tried putting the component areas into CCompRef1 in the standard injection and modifying the formula to GT(Area,S.%.CCompRef1[Area])) but again nothing. It seems like this should be easy to do but I cant find a way! Do you have a "summarize custom fields" line at the end of your SSM? Hi Dan, no I don't because there is no summary function like Average. Max PROD etc in the formula, unless I'm missing something. I see it as a standard Boolean formula. I'm wondering can you actually test a function like area based on another intersample calculation (S.%.CCompRef1[Area[), maybe it doesn't work like that. Dar Empower2018, you need the "summarize custom fields" line for any intersample calculation. Your first boolean expression should then work. Hi crimango, I already use intersample custom fields that work without summarize custom fields eg A.%.(Area)*CConst1. Is it the case where all Boolean functions in a formula will require summarize custom fields? 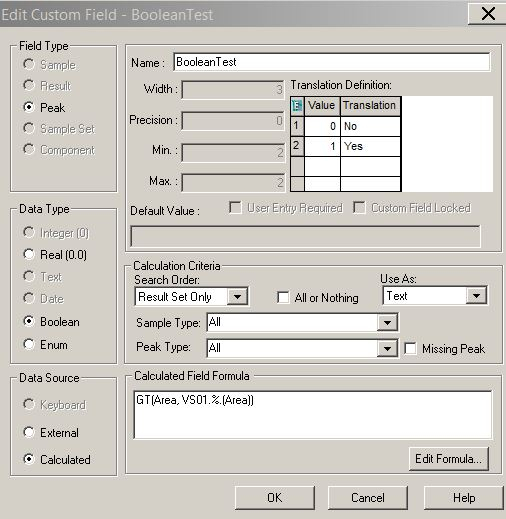 I have plenty of examples where I have boolean fields without a summarize custom fields instruction in the sample set. As you said, it is only needed when you have a summarize-based function like AVE in the formula. What I don't see in your description is any detail about the translation table and what you may or may not have listed there. Boolean fields will only return a 0 or 1 (False/True). I've recreated your original formula in a test project and it works fine for me (attached). What do you have in the top right under the translation definition? Maybe a screenshot of your field configuration may help if this is not sufficient to clarify. Hi MJS, I'm glad it worked for you as it means I'm only doing something small wrong. Yes, I set my translation table to 0 = Test Pass and 1 = Test Fail. I didn't use as text though I set it as position but that doesn't really make a difference right? Text is only useful if you want to group reports by Pass/Fail or use in additional custom fields like SUM(EQ(Boolean_Test,"Fail")). Ill have a closer look at the labels and functions in the sample set when I get a chance. If its working for you then its obviously possible.